Over time your sports surface may become damaged or worn out due to excessive and repeated use. Our company can carry out services like resurfacing for netball courts to restore the original quality. A netball court resurfacing process can dramatically improve your existing sports surface, whilst providing excellent playing properties for those who will make use of the court. There are different types of resurfacing services that can be carried out for these facilities. Full netball court resurfacing may be required for facilities that are beyond repair. This includes pulling up the current surface and then installing a new layer of polymeric rubber or tarmacadam. We can also carry out a netball court resurface without ripping up the existing surface. For this type of project, court binder is applied to cracks on a macadam surface, and then a layer of polymeric rubber is installed over the surface, or a coating of non-slip paint is applied. Non slip coating can be applied in a number of different colours. Coloured anti slip paint can improve the aesthetics of the netball court, as well as improve performance characteristics. After the netball court resurfacing is complete you will be able to see a difference in game play and the overall appearance of the court. Our non-slip coating and polymeric rubber are porous materials and so they are Sustainable Urban Drainage Systems (SuDS) compliant. The porous properties help to prevent flooding and waterlogging of the surface in wet weather. 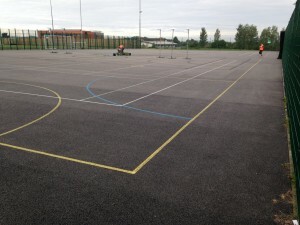 When resurfacing is carried out we are also able to upgrade your netball court and change your specification to a multi-use games area, if you want to start using the facility for additional sports, like basketball and even tennis. 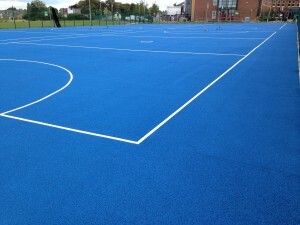 Additionally, a number of other services may also be undertaken after the netball court resurface, for example line marking; this will create a professional sports facility for players to use. To speak to one of our netball court resurfacing experts today, please take a moment to complete our contact form. We’ll get back to you as soon as we can to offer some advice on the costs for renovating the sports surface. After installing or resurfacing a netball court, it is important to keep the surface in good condition. Netball court maintenance can be carried out by our expert professionals to look after your sports surface. You can reduce the amount of reactive maintenance needed, simply by being proactive with your upkeep strategy. We are able to apply a moss and algae treatment, as part of your netball court maintenance approach, in order to prevent surface contamination. You can also keep your surface clean by simply brushing away dirt and other natural matter. One reason that netball court maintenance is so important is to ensure that the people using the facility are safe and the sports can be played to their maximum potential. If you carry out routine maintenance, you will be able to reduce the amount of damage to the surface. We recommend carrying out frequent inspections to make sure that there is no damage to your surface, which could be a potential risk to the players. By finding problems early you are able to reduce costly repairs, including rejuvenation and even another netball court resurface. We hope that you have found this article useful; if you have please remember to share this post and let us know what you think in the comments section. You can also contact us if you’d like some more information on our expert services and the costs for what we do.